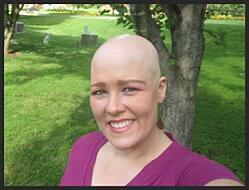 In June we talked with Adrienne, a woman who is bald from her alopecia, and her two friends, Marita and Marissa. The friends -- twin sisters -- had donated their hair and raised money to provide a custom-made wig for Adrienne. The story is amazing, but where we left off, Adrienne was still waiting for her wig. So, what happened? I checked in with Adrienne to find out! Below, you can read her emotional story in her own words! The excitement and anticipation built up over a year! As the time got closer to having the wig, I started to feel more and more afraid. This whole process was so blind to me. I sent Stephanie Caillabet pictures of my then current wig and described the length and style and colors I wanted as best I could. But after that I had to place my trust and faith completely in her and the process. I was used to purchasing synthetic wigs where the color is always the same and the style is pre-determined and if I didn't like it, I could return it. But this was such a special gift and something that could not be changed later on, so I had a LOT of anxiety surrounding the whole thing. In fact, when the wig finally arrived, I put it on my kitchen table and couldn't bring myself to open it for a full 2 days. But when I finally saw this beautiful creation that was made just for me, all the fear and excitement and love poured out of me in a huge wave of tears and a grateful feeling of relief. It sounds so cheesy, but putting it on for the first time, I felt like I could feel Rissa and Rita with me. And even more I could feel the love and generosity of each of my donors in there too. It was magical. Now, when I wear my wig, I can't stop twisting the hair around my fingers and turning my head back and forth just to feel the deliciously silky locks on my skin. It's strange but, I had forgotten what it felt like to have your hair brush your shoulder! It was an incredible, once in a lifetime experience that bonded me closer to two of the greatest women I have ever known, bonded me closer to the generous people in my life and served to help me feel more comfortable with myself and being who I am. Since "coming out" last year when Rita, Rissa and I posted the original crowd-funding message, I have been pretty open in discussing my Alopecia and have been announcing each of the interview/articles that we have done so far. Our friends have been overwhelmingly supportive and kind. They have all expressed such words of love and encouragement and friendship, and so SO many people reached out to let me know that they thought the wig was beautiful and that I looked beautiful in it. I also decided to post a picture of myself sans wig, which I had NEVER done before and had never even considered doing in the past, It felt liberating! I was floored by how many people told me they loved my bald picture as much as the new wig pictures. This whole experience was so much more emotional than I ever expected. I knew I felt terror at the idea of coming out to everyone and even more so at asking people for their money! I expected to receive sort of radio silence. I didn't expect overtly mean comments (though I did fear this every second) but I anticipated that people would sort of... look away. But I didn't expect the feelings I would have about myself afterward and in the time waiting for the wig. 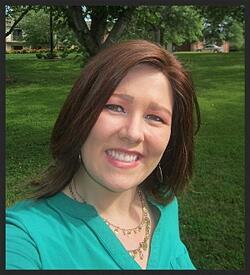 We are so happy for Adrienne, and honored to share her complete story here. We hope this inspires others to talk more about their alopecia. We would love to hear your thoughts in the comments!